When Veena asked me do a guest post I was hesitant and happily forgot about it until she reminded me again but still I took time to prepare this post as to decide what to post is big task for me. Veena asked me something with peas so I decide to post this simple, easy and yummy potato & peas pulao. This one is good for lunch box as it's can be done in jiffy in pressure cooker and it's filling, you can do the same in rice cooker or in a pan too. 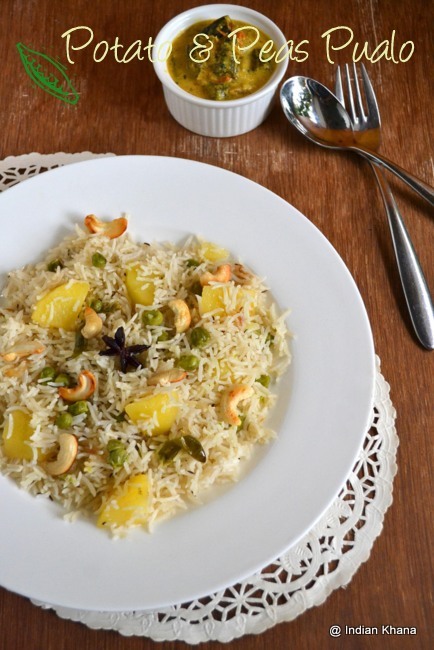 The best thing is this pulao goes well with just anything be it a simple raita, any curry or dal. If you have guests at home then this can be a good option too. 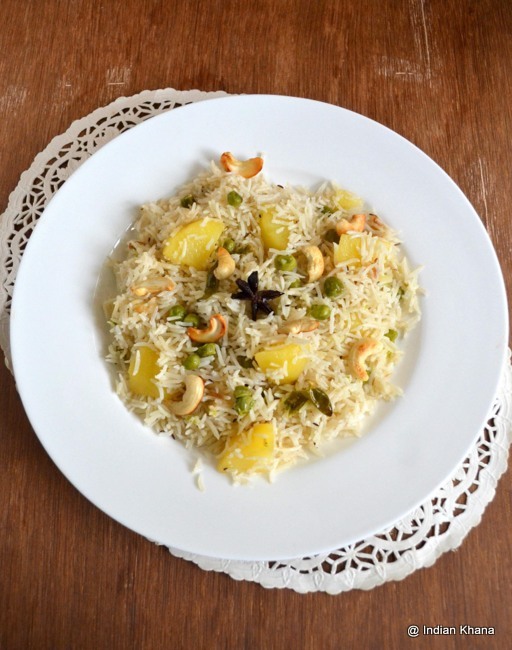 I spiced this pulao mildly and wanted potato and peas to dominate the taste plus the cashews adds good crunch, so check out the recipe. 1. Soak rice for 30 minutes or until required. Wash and keep aside. 2. Peel and slice onion, peel and chop potato in chucks and slit chillies. 3. Heat 1/2 tbsp oil/ghee in a pressure cooker and saute cashews until golden brown, keep aside. Add remaining oil/ghee and heat, add whole garam masala, caraway seeds and allow to splutter. 4. Add onion, green chilli, ginger-garlic and saute until onion becomes pink, add potato and saute for 2 minutes. 5. Now add peas and saute for a minute, add rice and mix everything well and saute for a minute. 6. Add water, salt close cooker and cook for 1 whistle, low flame and simmer for 2 minutes off flame. 7. Once all pressure released open cooker and gently fluff rice with fork. Serve with any side dish. yummy pulao priti.. thanks for sharing her recipe veena..
Love the vibrant colors,so inviting. Fabulous and adoring the flavors with the ingredients added inside. We are big eaters of rice and for the next meal, am gonna try this version of rice dish. 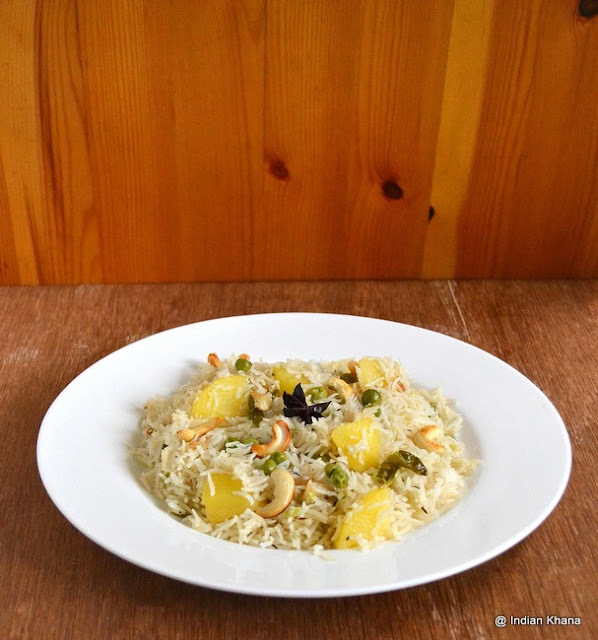 delicious pulao with an awesome combo. simple yet flavorful rice. nice clicks too. 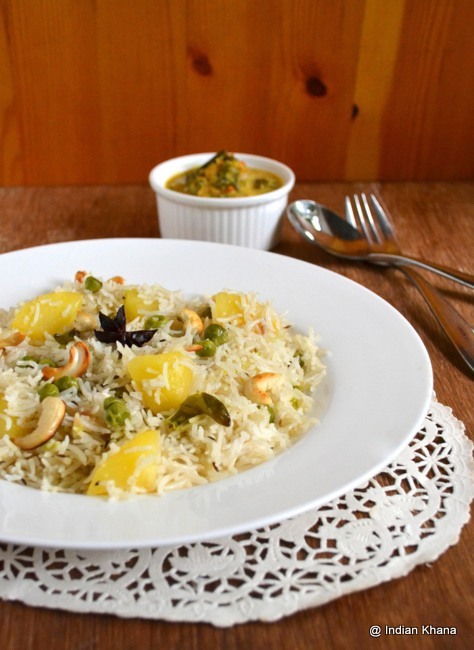 Delicious potato and peas pulao veena, Great guest post, Preethi and Veena. ;) I may return once again since I bookmarked it. Its come out perfect and well flavoured! A lovely guest post and dish! This pulao looks absolutely delicious. lovely Veena!! pulao looks so delicious and colorful! looks so delish!! nice post.